Seven-in-ten U.S. adults say it is at least somewhat likely that their own phone calls and emails are being monitored by the government, including 37% who believe that this type of surveillance is “very likely,” according to a Pew Research Center survey conducted in February. Just 13% of the public say it is “not at all likely” that the government is monitoring their communications. These views are prevalent across a number of different demographic groups, but there are some differences based on age, gender and education. Most notably, nearly eight-in-ten U.S. adults under the age of 50 think it is likely that the government is tracking their communications, compared with around six-in-ten of those 50 and older. Additionally, men are more likely than women to suspect government monitoring, as are those with a high school degree or less compared with people who have a college degree or higher. Americans across the political spectrum are equally likely to think the government is monitoring their phone calls or emails. Seven-in-ten Republicans (including independents who lean toward the Republican Party) say this, the same share as among Democrats and Democratic-leaning independents. But while many Americans assume that the government is monitoring their personal communications, they have expressed discomfort with this activity in the past. A 2015 Pew Research Center survey found that nearly six-in-ten Americans (57%) believe it is unacceptable for the government to monitor the communications of American citizens. 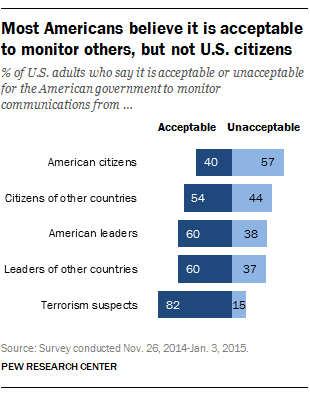 But the survey found that around half of Americans say it is acceptable for the U.S. government to monitor the communications of citizens of other countries. Similarly, in a survey conducted in 2014, a slight majority of Americans (54%) said they disapproved of the government’s collection of telephone and internet data as a part of anti-terrorism efforts.